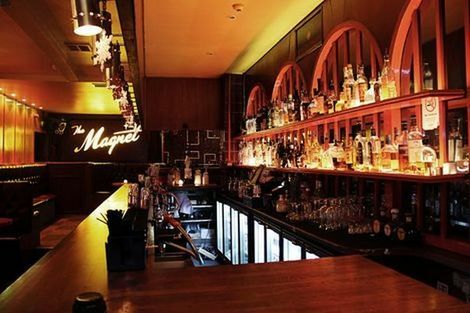 Iconic Liverpool bar The Magnet to relaunch with live music and late night parties. Liverpool iconic bar The Magnet reopens tomorrow promising a return to its music roots. New owners of legendary Hardman Street music hub are celebrating 54 years of late night parties as they prepare to throw open the doors after a recent facelift. With a history spanning six decades, The Magnet, which originally opened in the 1960s, has undergone a series of transformations, with the latest focusing on Liverpool’s new music scene. Manager Josh Boyd said: “Many of the bars in Liverpool have been on a journey since the 1960s and none more so than The Magnet. In 2011, Getintothis reported The Magnet‘s reopening after a multi-million pound refit which saw the club revamped into a Las Vegas styled gambling hall from the 1970s before closing once again in July 2013. But it’s celebrated history goes back much further. Originally, a street level bar named the Rumblin’ Tum while the basement, named the Sink Club, was one of the city’s first black music venues and entry was by way of a numbered sink plug on a short length of chain which proved membership. From 60’s soul to 70’s disco, to nuances of reggae and ska in the 80’s and electro in the 90’s, The Magnet has always been a melting pot for different music genres and a meeting place for people from all walks of life, with a genuine appreciation for alternative music. The new management behind its re-launch want to remember its routes, and bring back that unique vibe for which The Magnet is so loved and remembered by generations of music-lovers in the city. “It was the first true ‘black music’ venue in Liverpool, at a time when social rifts were ever present in society,” Boyd added. “Parties down in the basement were a popular place for friends to meet in an environment that didn’t distinguish by colour or by creed, but instead brought people together through a shared love of emerging music of the time. “It is exactly this that we want to reintroduce to the Liverpool social scene, and we feel that now is as good a time as any. A number of acts have played the stage in the bars bustling basement over the years, including Ibis, Gregory Isaacs, Ron Ayers, Deaf School and Pete Wylie. Meanwhile, music legends Freddie Mercury and Brian May played there with their band Smile, an early incarnation of what later became Queen. Despite its impressive past, The Magnet has always championed grassroots Liverpool music and The Magnet will be launching a brand new programme of regular events, including “Live at the Magnet” – a fortnightly music spot which will support emergent talent. Unsigned acts will line-up alongside established artists with a flavour of what to expect during tomorrow night’s launch with Liverpool acts We, The Undersigned and The Fire Beneath The Sea performing alongside DJ Dave Booth. Tickets are £3. For more information visit The Magnet here. On Friday, Magnet opens at Midnight for Liverpool club promoters’ Rubix hosting their launch until 6am with Lee Charnock, Chris McGee, Phil Fearon and Jake O’Toole taking to the decks. Details here. Liverpool club Magnet set to reopen once again. East Village Arts Club: Liverpool music is exciting – we want to be a part of it. The Kazimier: We have no concern about our secrets getting out.